We've had a quiet-ish weekend here, because we're waiting for an opportunity to borrow a truck to get more sheet goods (drywall, more cementitious siding, and so on), and also because events conspired to send Noel off to be a musician for a dance workshop, leaving me unsupervised with a weedy garden and three hungry chickens. 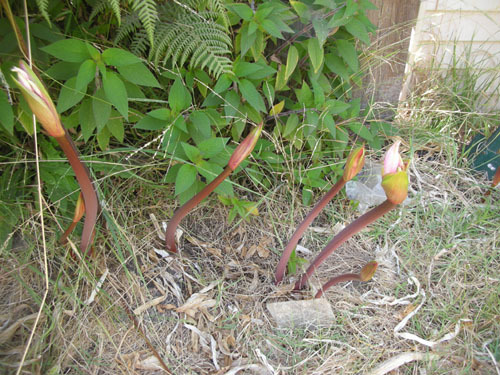 It's midsummer, which means the Amaryllis belladonna are sending up their buds. Every year they come up in more places I didn't expect, including a massive patch out front. These ones, planted in the back alongside our neighbor's cottage, were a gift from a friend who was thinning her own patch. Every time I see them I remember when the foundation project was finally over and I saw their leaves coming up under the piles of trash that Contractor A (who liked to throw trash from his lunch into a pile in the yard, rather than into the trash can) left all over the yard. 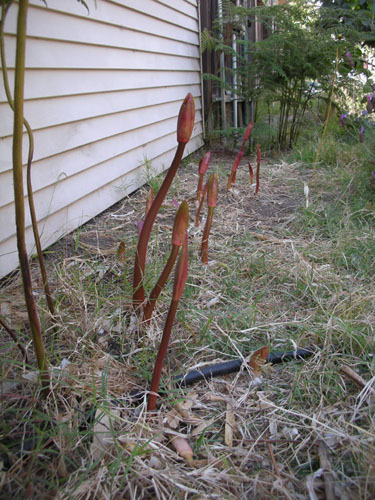 And since they thrive on neglect, they are a perfect plant for filling in weird spots like right next to a house at the back of a deep bed. I like how weird they are. I've tried, over the last couple of years, to plant other things around them, but nothing has really stuck. The dogs spend a lot of time messing around over there, and the Bermuda grass is pretty well-established, so it's sort of a losing battle. Not that I care that much, given my much larger weed problems. Earlier this week, I finished the new berry bed alongside the chicken yard. (See Carole there, coming to see if I have any treats?) We have two raspberries planted here: Heritage and Fall Gold (red and yellow). 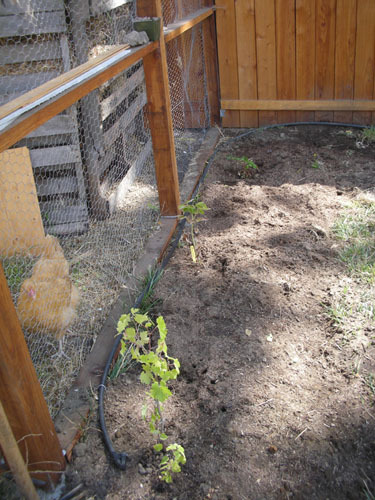 I'm going to get some edging to make a root barrier on the yard side, and the chickens will be in charge of being on raspberry runner patrol on their side. Given the scorched-earth of the chicken yard, this should not be too much work for them. Also in the bed is a cabernet grape, which I'm hoping to train up and over the West side of the chicken yard for a little dappled shade. Anyway, this is what I worked on today. 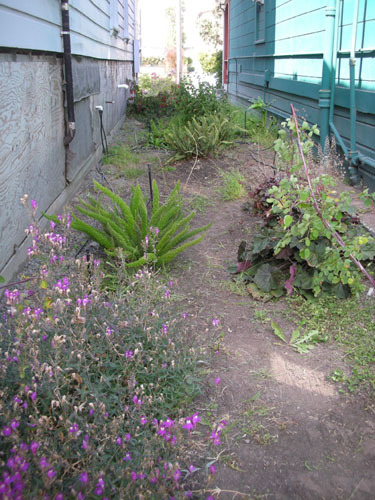 The weeds in the Fern Walk were waist-high, so I got out my little wagon and spent a few hours clearing things out. I'd done an hour of work earlier in the week, but today's work got me all the way to the end. Now I need to find my pruners and work my way around front, pruning back the roses as I go. I can't figure what could have happened to my secateurs and loppers, but they were hiding earlier today. Looking good! Those amaryllis are weird but interesting. Wish we could grow them here. Root barrier's definitely a good idea for the raspberries!